Which is an impressive 750ml of a 9% ABV Belgium beer in a bottle that has a cork and wire trap. It’s a bit festival. That means that it is brewed within the walls of a Trappist monastery under the control and responsibility of the community of monks, and whose revenue is devoted to social service. When they say within they mean close walking distance. and I also found out that there is an International Trappist Association. This is a dark beer, and as a top fermented Trappist beer, is re-fermented in the bottle, and is not pasteurised. So then, the big question it really will it pour with a head, and I’m picking yes, I’ve not been let down on that front with a Belgium beer before. The cork is excited to be free for a start, a pleasant pop. And you can hear the carbonation and see how fizzy it is in the glass. It’s a noisy beer. You can smell yeast too. That’s a dark deep taste, quite sweet, deep, and I was surprised how the deep chestnut colour matched a taste I was expecting. I don’t know if that made sense though. It’s like there are raisins in it, which Isn’t unpleasant and this does have a nice length to it too, Licking my lips, trying to remember that this one comes with a well hidden 9% behind it. I’m a fan of Belgium beer, and for that reason the arbitrary pdubyah-o-meter will score a high 9 from 10 arbitrary things for this. It’s fantastic, I’ve been looking forward to it and I’m pleased that I’m drinking it. Nothing bad to say except I was expecting some lacing on my glass which I didn’t get. The monks however did good with this one, and I’d suggest they keep their day jobs. 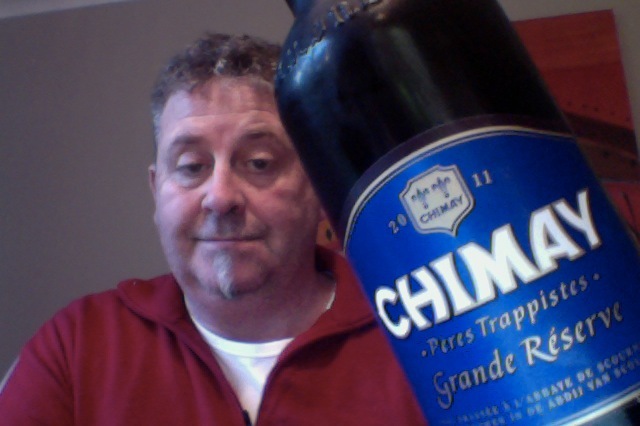 This entry was posted on August 18, 2012 by Philip Walter in Beer, Beer of Belgium, Belgian Strong Ale, Chimay, Justsaying and tagged Alcohol by volume, Authentic Trappist Product, Beer, Beer in Belgium, Belgium, belgium beer, heavenly beer, Scourmont Abbey, Trappist, Trappist beer.